You’re reading this article, so you obviously care about your finances. Hopefully, you’re on track with your money or working toward that goal. Getting out of debt, saving and investing have been beaten into you by every financial outlet in the world. Maybe you’re even on the path to financial independence or early retirement. But have you taken the time to figure out what you need by looking at your post-retirement multiplier? What is a Post-Retirement Multiplier? When I talk about your post-retirement multiplier, I’m referring specifically to a number – the amount of your current expenses as compared to your post-retirement expenses. It might be 0.75 or it might be 1.5, but it’s an important number to be aware of when planning your future. For most of us, there’s no good way to know exactly if we’re going to spend more, less, or the same in retirement. The “experts” tend to say that you should anticipate that you’ll spend 70-80% of your current pre-tax current income in retirement. For instance, many recommend that you save enough to replace 80%—not 100%—of your preretirement income over a 30-year retirement. The formula assumes that you will no longer be paying payroll taxes, saving for retirement or covering work costs, and that you may be in a lower tax bracket. A widely accepted tenet of retirement planning is that you need to replace just 70% to 80% of your pre-retirement income to maintain your standard of living after you call it a career. Here’s my biggest problem with that – they’re basing that off the assumption that you’re not saving a lot. I discussed that issue in It’s Not How Much You Make, It’s How Much You Keep. The more you’re saving now, the less you’re actually living off of. What matters are your expenses. If your total expenses come to around $35,000/year, that has nothing to do with your salary. 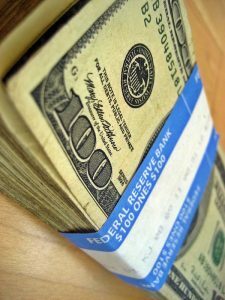 Your salary becomes irrelevant in how much money you need to live off of later in life. In other words, you could be making a $50,000 salary and, according to the “experts,” you would need $40,000 per year in retirement (figuring 80% of your income). But if you made a $200,000 salary, that 80% would come out to be $160,000. That’s a pretty big difference, but it has nothing to do with what you really need. If your expenses are $35,000/year, then you need $35,000/year. 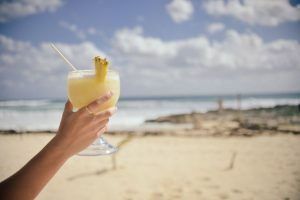 There are going to be some of you who plan to move to a fancy house right on the beach somewhere with servants bringing you Malibu and pineapple drinks all day (whoa, that does sound like a good plan!!). That’s operation’s going to cost you a pretty penny and, assuming you’re not already doing that now, your expenses are going to go up and push you over the 1x mark… maybe your post-retirement multiplier will be 1.75 (1.75 times your current expenses). On the flip side, some of you might be planning to downsize your house and live as frugally as you can just so you can stop working as soon as possible. I do have to say that those Malibu and pineapples in the beach house sound slightly more delicious than this though! If you’re really the frugal-jammer and you’re able to bring those expenses down, your post-retirement multiplier might be something like 0.6 (0.6 times your current expenses). However, most of us will fall somewhere in the middle. Most of us will have a lifestyle that stays pretty similar to what you have going today. Your expenses might go up for a little bit right after retirement for travel, eating out, etc. but then they’ll probably trickle back down. Maybe we spend a little more, but get a job for a few hours a week to fill some time. Just for fun, let’s assume that if you nailed your expenses exactly the same as today, your post-retirement multiplier could be 1 (1 times your current expenses). One option for me is to stay here in Ohio hating every winter and just living the dream. My house would be paid off (or shortly after quitting the 9-5) and I would still live a life similar to the one I do now except no 9-5. But who knows – maybe my blog will continue to grow during that time. In addition, all the hobbies I want to get started on are free or pretty cheap, with the exception of starting a raised garden. I’m very excited about my garden probably something like a 10′ x 10′ or slightly bigger area. I don’t know what the cost is for a hobby like this, but I would hope some of it would be offset by the food it’s providing. If I follow path #1, my post-retirement multiplier will likely stay pretty similar to what it is today. I would probably put our post-retirement multiplier to be close to 1 in relation to our current expenses in this scenario. Path #2 is probably not quite as likely, but I sure hope for it anyway… and that would be that we pack up our $%^ and move to Panama. We’ll actually be exploring this option with a “recon” trip/vacation next summer, but in the meantime, we’ll say that it’s just a pipe dream. Still, it’s worth exploring the idea. And chances are, when we first moved there, we would be spending a little more on buying things we needed for furnishing our house or condo. We would also probably still be buying some of the Americanized goods until we became fully acquainted with the Panamanian lifestyle. However, even though our expenses would likely go up at first, we would most likely be spending quite a bit less in the long run than we are currently. And of course, I would still be building my garden in Panama as well – though it might have more exotic fruits and vegetables in it! In other words, if I follow path #2, my post-retirement multiplier will actually probably go down from our current expenses. Unfortunately, there will be a lot of unknowns with this path. However, I’m going to guess that our post-retirement multiplier in this scenario to be around a 0.8 in relation to our current expenses. We’ve set ourselves up with low expenses which should pay off really well for us once we hit financial independence as long as we stay the course. Things do change and you need to be flexible though. How do you anticipate your post-retirement expenses to compare to your expenses today – what would your post-retirement multiplier be? Same question if you’re already retired, but is it more or less than you originally expected it to be? We’ll probably live in a modest house in the burbs somewhere and our cost of living won’t change much. However, we will plan on traveling as often as we can while we’re still young and can show our kids the world. So I’d guess our multiplier may be in the 1.5 to 2.0 range with a lot of discretionary spend built in. We’ll see though. Still too early to model or estimate anything too specific. I think that’s awesome that you want to travel with your kids – and smart to do it while your young. Seems like a lot of people plan to travel when they’re older, but a lot of times, the physical constraints end up making it more difficult. Good one Jim! I liked the irreverent attitude in this post! As I’m sorta-semi-mostly-not sure what to call it-retired, my expenses should stay about the same. We have close to $50k in dividend income and “core” expenses of about $40k. That leaves ten thousand dollars a year to fund vacations and activities. $10k a year for vacations and other activities sounds like a nice number – you can do a lot of good stuff with that number. I expect our expenses to go up slightly but I’m not quite sure how much yet. I want to maintain a hom base we stay at 6 months of the year. For the other 6 months I want to do something like buy a small travel trailer in various countries and tour each one for 6 months at a time, I suspect a bump in some years for higher cost countries like Australia. However I foresee it averaging out to about 1.1 times my current expenses. It’s definitely an interesting topic to contemplate. Wow, that sounds like a cool plan! And not so far off your current expenses to plan for… nice!! So when doing the expenses do you also buy the 25x expenses for the 4% rule or are you more willing to be a bit riskier (e.g. 8x like Fidelity or others). Just curious. Another astute post from you Jim! This post retirement multiper is indeed a better way to look at the expenses compared to the usual advice we’re getting. It is so much more accurate. For me I’m a long way from retirement(hopefully not too long), if I retire early I reckon my multiper will be over 1, since I’ll probably be spending more. If I retire late though, it’ll probably be under 1, since it’ll best a pretty simple life. Anyway Panama! That’s pretty unusual! Thanks, T – I didn’t really think about that. For most people, if you retire early, you’re probably going to have a lot more on “the agenda” of things you plan to do so the expenses probably would be a bit higher than you might if you retire later in life. Thanks for sharing! Thanks, Mustard Seed – I’m sure I’ll be doing a number of related articles before and after our trip. Costa Rica is supposed to be a pretty good place to retire to as well from everything I’ve heard.